Platinum-based chemotherapy improves survival among patients with non-small cell lung cancer (NSCLC), but the efficiency is limited due to resistance. In this study, we aimed to identify the expression of Aurora-A and its correlation with cisplatin resistance and prognosis in NSCLC. We used immunohistochemical analysis to determine the expression of Aurora-A protein in 102 NSCLC patients treated by surgery and adjuvant cisplatin-based chemotherapy. The prognostic significances were assessed by Kaplan-Meier survival estimates and Cox models. The potential role of Aurora-A in the regulation of cisplatin resistance in NSCLC cells was examined by transfections using expression vector and small interfering RNA or using small-molecule inhibitors. Aurora-A expression was significantly associated with clinical stage (p = 0.018), lymph node metastasis (p = 0.038) and recurrence (p = 0.005), and was an independent prognostic parameter in multivariate analysis. High level of Aurora-A expression predicted poorer overall survival (OS) and progression-free survival (PFS). In vitro data showed that Aurora-A expression was elevated in cisplatin-resistant lung cancer cells, and overexpression or knockdown of Aurora-A resulted in increased or decreased cellular resistance to cisplatin. Furthermore, inhibition of Aurora-A reversed the migration ability of cisplatin-resistant cells. The current findings suggest that high Aurora-A expression is correlated with cisplatin-based chemotherapeutic resistance and predicts poor patient survival in NSCLC. Aurora-A might serve as a predictive biomarker of drug response and therapeutic target to reverse chemotherapy resistance. Lung cancer is the leading cause of cancer mortality worldwide. Non-small cell lung cancer (NSCLC) accounts for approximately 85% of lung cancers, including squamous cell carcinoma, adenocarcinoma and large cell carcinoma. The overall survival for NSCLC remains poor, with 5-year survival rates only 10–20%. Currently, surgery represents the main curative treatment modality for cure of NSCLC. Additional therapy is necessary because of high rates of distant and local disease recurrence after surgical resection. Platinum-based chemotherapy (cisplatin or carboplatin in combination with navelbine, gemcitabine, or paclitaxel) has been widely used as first-line regimen for advanced NSCLC. However, NSCLC patients frequently exhibit resistance to chemotherapy[4, 5]. Previous studies have revealed that the major resistance mechanisms include reduced uptake and/or increased efflux, enhanced DNA repair, and failure of cell-death pathways, metastatic tumor. In addition, several studies have reported multiple genetic aberrations that might predict cisplatin sensitivity in NSCLC patients, such as ERCC1, BRCA1, XRCC1 and CFL1[7–9]. However, much work remains to be done to validate the clinical relevance of resistance genes to benefit from adjuvant platinum-based chemotherapy. Aurora-A (also called STK15/BTAK) is a member of serine/threonine kinase family. It is involved in various mitotic events, such as centrosome maturation and separation, mitotic entry, bipolar-spindle assembly, chromosome alignment on the metaphase plate and cytokinesis. In human cells, Aurora-A expression and kinase activity are increased during late G2 to M phase, and its subcellular localization dynamically changes during the cell cycle. The levels of Aurora-A mRNA and protein are increased in various malignant tumors including colon, breast, bladder, ovarian and pancreatic cancers, indicating that it is important for tumor formation or progression[11–14]. Furthermore, we and others have previously showed that overexpression of Aurora-A increases migration and leads to resistance to chemotherapy drugs[15–18]. Accordingly, Aurora-A serves as a promising target in cancer therapy, and several small-molecule inhibitors for Aurora-A kinase are currently being investigated within clinical trials. The novel Aurora-A kinase inhibitor alisertib (MLN8237) is currently undergoing evaluation in a phase I/II trial with paclitaxel in recurrent ovarian cancer. The inhibitor alisertib seems clinically active in both B- and T-cell aggressive lymphomas, and confirmatory single-agent and combination studies have been initiated. In the present study, we detected the expression of Aurora-A in NSCLC patients treated with adjuvant cisplatin-based therapy and determined its correlation with clinical characteristics. We also validated an association between elevated Aurora-A expression and cisplatin resistance in vitro. In addition, we investigated the effect of Aurora-A on the sensitivity of cisplatin in A549 and H460 human lung cancer cells. The present study included 102 patients with NSCLC, diagnosed at the Cancer Center, Sun Yat-sen University between 2002 and 2003. The patients, 70 males (69%) and 32 females (31%), ranged in age from 38 to 75 years (mean 60 years). Histological examination was performed on formalin-fixed tissues in all cases and tumors were diagnosed and classified according to the AJCC (American Joint Committee on Cancer guidelines) classification. All the patients (from stage I to stage III) underwent radical surgery of primary tumor and lymph nodes, and received adjuvant cisplatin-based chemotherapy after surgery. No chemotherapy or radiotherapy was given to patients before surgery. Written informed consent for the use of the tissues was obtained from all patients before surgery, and the study was approved by the Institute Research Ethics Committee of Sun Yat-sen University. The human lung adenocarcinoma cell lines A549 and A549/DDP (cisplatin-resistant variant) were graciously provided by Dr. Xiaofeng Zhu, Sun Yat-sen University. The lung cancer cell lines NCI-H460 (H460) and H460/DDP (cisplatin-resistant variant) were graciously provided by Dr. Liwu Fu, Sun Yat-sen University. Both cell lines were cultured in RPMI-1640 supplemented with 10% fetal bovine serum at 37°C in humidified 5% CO2 incubator. The A549/DDP and H460/DDP cells were cultured with 6 μM cisplatin (Sigma–Aldrich, St.Louis, MO) to maintain drug resistance. Cells were transfected with an empty vector pCS2+ or pCS2 + -Aurora-A (a gift from Joan Ruderman, Harvard Medical School, Boston, MA), or interfering RNA (siRNA) and negative control using Lipofectamine 2000 as described earlier. The negative control (NC) siRNA and siRNA against Aurora-A (5′-AUGCCCUGUCUUACUGUCA-3′) were synthesized by GenePharma Company (Shanghai). Plasmid pLVX-DsRed-N1-Monomer (Clontech) expressing Aurora-A was from Dr. Feimeng Zheng, Sun Yat-sen University. The shRNA sequences against GFP (Sence-5′-GCAAGCTGACCCTGAAGTTCAT, Antisense-5′-ATGAACTTCAGGGTCAGCTTGC) and Aurora-A (Sence-5′-CACATACCAAGAGACCTACAA, Antisense-5′-TTGTAGGTCTCTTGGTATGTG) were cloned into pLKO-Tet-On (Addgene). Lentiviruse was produced in 293T cells as described earlier. The MTT assay was used to assess cell viability. 5,000 cells were plated in 96-well plates and then were exposed to various concentrations of cisplatin, VX-680 (Kava Technology), MLN8237 (Selleck Chemicals) or combinations. Following treatment, 0.5 mg/ml MTT (Sigma–Aldrich) solution was added to each well, and incubated for 4 hours (h). After the incubation, culture media was discarded followed by addition of 0.15 ml DMSO and vibration for 10 minutes (min). The absorbance at 570 nm was determined. The cell inhibition ratio was calculated as a fraction of the untreated controls. 5,000 cells were seeded into six-well plates in triplicate and incubated for 8–10 days. Colonies were stained with crystal violet and counted. Cells were lysed with the RIPA buffer on ice before being subjected to western blot analysis. The protein concentration was detected by the Bradford method. Total proteins were fractionated using SDS-PAGE and transferred onto nitrocellulose membrane. The membrane was blocked and incubated with mouse anti-GAPDH antibody (Ambion Biotechnology), rabbit anti-Aurora-A antibody (Upstate), rabbit anti-p-Aurora-A antibody (Thr288, Cell Signaling), rabbit anti-histone H3 antibody (Epitomics), and rabbit anti-p-histone H3 antibody (Ser10, SAB). Cells were fixed with 4% paraformaldehyde at room temperature for 15 min and permeabilized in 0.25% Triton X-100 in PBS for 10 min, and incubated in 3% BSA blocking solution for 30 min. The cells were incubated with anti-Aurora-A (Upstate) and α-tubulin (Sigma) antibodies for 1 h. The immune complexes were detected with goat anti-mouse conjugated to Alexa-488 and goat anti-rabbit conjugated to Alexa-546 secondary antibody (Molecular Probes). Nucleus was stained with DAPI. Apoptosis analysis was conducted with an Annexin V-FITC Apoptosis Detection Kit (KeyGen Biotech) according to the manufacturer’s protocol. The percentage of apoptotic cells was determined using FACS flow cytometer equipped software (BECKMAN). Cells transfected with RNAi or not were seeded in 24-well plates and grown until 70-80% confluence. The cells were then serum starved for 24 h. A linear wound was created using a pipette tip and observed and photographed at various times as indicated in the figure legends. Formalin-fixed, paraffin-embedded samples were cut in 4 μm sections and mounted on slides. Slides were deparaffinized, rehydrated, and treated with 3% H2O2 in methanol for 15 min to inhibit endogenous peroxidase. Pretreatment was done in microwave with Tris/EDTA buffer solution (pH 8.0). After transfer to a humidified chamber, the slides were blocked with 10% normal goat serum at room temperature for 30 min and incubated with mouse anti-Aurora-A monoclonal antibody (Sigma, A1231, 1:200 dilution). Detection of the primary antibody was done using the Envision DAKO EnVision Detection kit, (3, 3-diaminobenzidine; code K 5007, DAKO Cytomation, Glostrup, Denmark) according to the protocol of the manufacturer. Finally, samples were counterstained with hematoxylin, dehydrated, and mounted. The positive control sample was a normal colonic mucosa section known to express Aurora-A. The negative control was obtained by replacing the primary antibody with a normal murine IgG. Each case was rated according to a score that added a scale of intensity of staining to the area of staining. At least 10 high-power fields were chosen randomly, and >1,000 cells were counted for each section. The intensity of staining was graded on the following scale: 0, no staining; 1, weak; 2, moderate; 3, strong. The area of staining was evaluated as follows: 0, no staining of cells in any microscopic fields; 1+, <30% of tissue stained positive; 2+, between 30% and 60% stained positive; 3+, >60% stained positive. The minimum score when summed (extension + intensity) was therefore, 0, and the maximum. Two independent pathologists (W.H.Z. and J.X. ), blind to follow-up data, were responsible for IHC staining evaluation. A third pathologist arbitrated when any discrepancy arose between these two pathologists. Receiver operating characteristic (ROC) curve analysis was carried out to select Aurora-A cutoff score[27, 28]. In brief, at each immunohistochemical score, the sensitivity and specificity for the outcome under study was plotted, generating an ROC curve. The score localized closest to the point at both maximizing sensitivity and specificity, the point (0.0, 1.0) on the curve, was selected as the cutoff score above which Aurora-A expression was considered high. To facilitate ROC curve analysis, the survival features were dichotomized: survival (death VS. others (censored, alive or death from other causes)). All patients had follow-up records for over 5 years. After the completion of therapy, patients were observed at 3 month intervals during the first 3 years and at 6 month intervals thereafter. OS was defined as the time from diagnosis to the date of death or when censored at the latest date if patients were still alive. PFS was assessed from the first day of treatment to the earliest signs of disease progression as determined by CT or MRI imaging using RECIST (Response Evaluation Criteria In Solid Tumors) criteria, or death from any cause. Optimal cutpoint for Aurora-A expression was obtained by ROC analysis. The chi-square test or Fisher’s exact test was used to estimate the correlation between Aurora-A expression and clinic pathological variables. Univariate survival analysis for Aurora-A was carried out using the Kaplan-Meier method, and the differences in survival probabilities were evaluated by the log-rant test. The hazard ratios and 95% confidence intervals for patient outcome were determined using the multivariate Cox proportional hazards model. Statistical analysis was performed using SPSS v. 17.0 (SPSS, Inc, Chicago, IL). Two-sided P values < 0.05 were considered statistically significant. Experiments were repeated at least three times. Data were mean ± SD. Differences among variables were evaluated by ANOVA, two-tailed Student’s t-tests. P values < 0.05 were considered to be significant. The specificity for antibody targeting Aurora-A was showed in Additional file1: Figure S1 by western blot analysis. 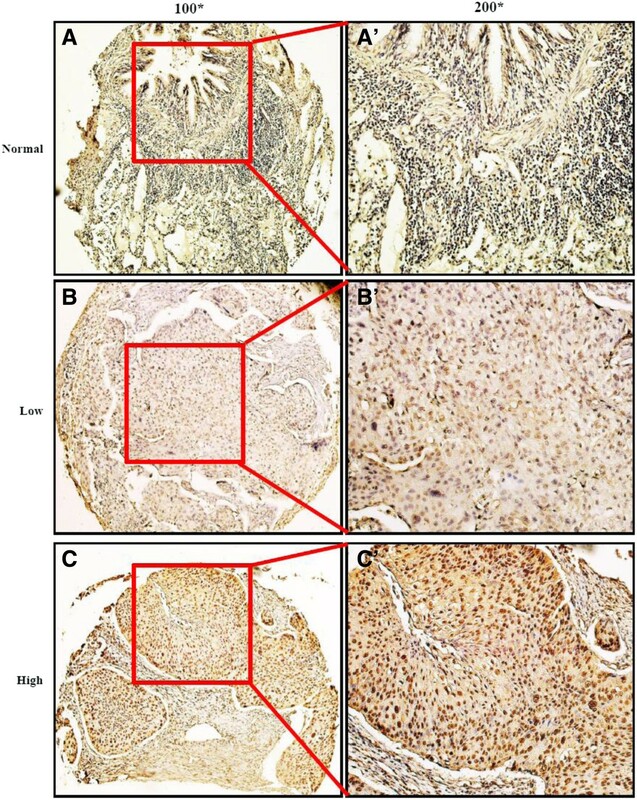 The staining of Aurora-A was nearly negative (Figure 1A and A’) in adjacent non-neoplastic lung tissues, whereas NSCLC tissues showed elevated expression of Aurora-A (Figure 1B and C). Aurora-A staining located in both nucleus and cytoplasm, predominantly in nucleus (Figure 1B’ and C’). To select a relevant immunohistochemical cutoff score to describe Aurora-A overexpression in NSCLC, receiver operating characteristic (ROC) curve analysis was carried out. As shown in Additional file1: Figure S2, the Aurora-A cutoff scores for OS and PFS were 3.4 (p = 0.004) and 3.2 (p = 0.014) respectively. We thus divided the cohort into high (score ≥ 4) and low (score < 4) populations based on the cutoff points. Representative specimens of Aurora-A expression are shown in tissue microarrays by immunohistochemistry analysis. (A) Non-neoplastic lung tissues showed nearly negative expression of Aurora-A (100×). (B) Low-intensity Aurora-A expression was shown in a NSCLC patient sample (100×). (C) High-intensity Aurora-A expression was shown in another NSCLC case (100×). (A’), (B’), (C’) demonstrated the higher magnification (200×) from the area of the box in (A), (B), (C) respectively. Clinicopathological features were listed in Table 1 in relation to Aurora-A expression status. High expression of Aurora-A was detected in 57 out of 102 (55.9%) selected NSCLC tissues and low in other 45 (44.1%) cases. In high-Aurora-A expression group, the incidence of cases in stage III was statistically significantly higher than in the low-Aurora-A expression group (77.2% vs. 51.1%, respectively; p = 0.006). Further correlation analysis demonstrated that high Aurora-A expression was significantly associated with clinical stage (p = 0.018), lymph node metastasis (p = 0.038) and recurrence (p = 0.005). Regarding other clinicopathological variables, there was no statistically significant correlation observed in age, gender, smoking history, carcino-embryonic antigen (CEA), histology, differentiation and tumor stage. The Kaplan–Meier analysis indicated that the overall survival (OS) of patients with high Aurora-A expression was significantly poorer than those with low Aurora-A expression (the median duration of OS 27.25 vs. 72.2 months, respectively, p < 0.001; Figure 2A). Also, elevated expression of Aurora-A predicted an inferior progression-free survival (PFS) with the median duration of PFS 15.5 vs. 57.5 months respectively (p < 0.001, Figure 2B). Kaplan-Meier survival analysis of Aurora-A expression in NSCLC patients. (A) High expression of Aurora-A (Aur-A) was closely correlated with poor overall survival, (B) and progression-free survival. 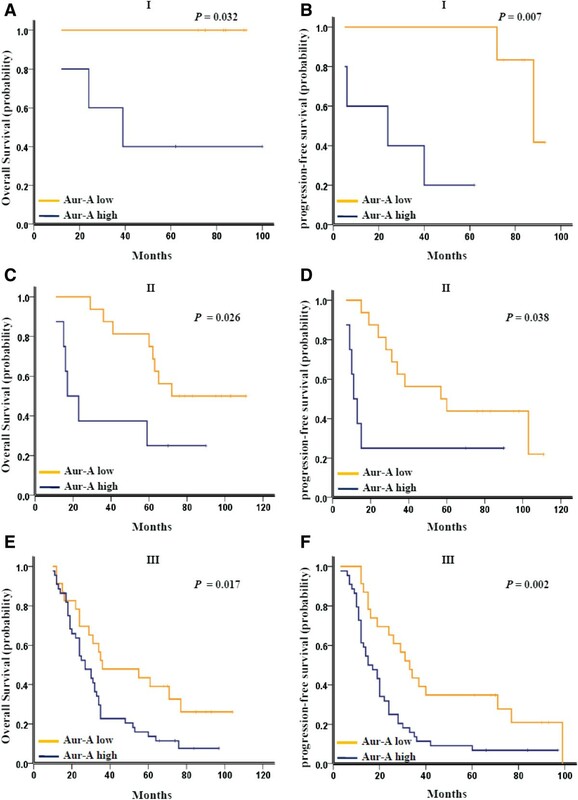 The median duration of overall survival for patients with high and low expression of Aurora-A was 27.25 vs. 72.2 months (p < 0.001) and 15.5 vs. 57.5 months (p < 0.001), respectively. Further analysis was performed between Aurora-A expression and subsets of NSCLC patients with each clinical stage. High expression of Aurora-A associated with a significant trend toward worse OS and PFS in patients of stage I (p = 0.032 for OS and p = 0.007 for PFS, Figure 3A and B), stage II (p = 0.026 for OS and p = 0.038 for PFS, Figure 3C and D), and stage III (p = 0.017 for OS and p = 0.002 for PFS, Figure 3E and F). Kaplan-Meier survival analysis of Aurora-A expression in subsets of NSCLC patients with different stage. (A) Probability of overall survival and (B) progression-free survival of NSCLC patients with stage I in the testing set: low expression, n = 6; high expression, n = 5. (C) Probability of overall survival and (D) progression-free survival of NSCLC patients with stage II in the testing set: low expression, n = 16; high expression, n = 8. (E) Probability of overall survival and (F) progression-free survival of NSCLC patients with stage III in the testing set: low expression, n = 23; high expression, n = 44. Multivariate analysis using the Cox proportional hazards model revealed that high Aurora-A expression was an independent and significant prognostic factor for OS (hazard ratio: 3.311; 95%CI: 1.899-5.775; p < 0.001; Table 2) and PFS (hazard ratio: 3.360; 95%CI: 2.066-5.466; p = 0.003; Additional file2: Table S1). Of other parameters, CEA level was evaluated as a positive independent prognostic factor for OS and PFS, tumor size for PFS. Since high level of Aurora-A was correlated with poor prognosis in NSCLC patients that treated by platinum-based chemotherapy, we sought to explore the association between Aurora-A expression and cisplatin-resistance in vitro. We detected the protein expression level of Aurora-A in A549 and drug-resistant A549/DDP cells by Western blot and immunofluorescence analysis. As shown in Figure 4A (upper panel) and B, Aurora-A expression was elevated in cisplatin-resistant A549/DDP cells. A549/DDP cells with higher Aurora-A level also showed raised proliferation (Additional file1: Figure S3). In another lung cancer drug-resistant cell line H460/DDP, Aurora-A expression was elevated relative to H460 cells (Figure 4A, lower panel). Then we performed forced expression of Aurora-A in A549 and H460 cells (Figure 4C), and treated the cells with increasing concentrations of cisplatin. Forced expression of Aurora-A increased the resistance of A549 and H460 cells to cisplatin in cell viability assay. Colony formation assay indicated that overexpression of Aurora-A enhanced cell growth and resistance to cisplatin in A549 cells (Figure 4D). Aurora-A overexpression correlates with cisplatin resistance in vitro. (A) Protein level of Aurora-A was detected in A549 and A549/DDP cells or in H460 and H460/DDP cells by western blotting. Equal loading of protein was determined by GAPDH. (B) The staining of Aurora-A by Immunofluorescence in A549 and A549/DDP cells. Red: Aurora-A; Green: Tubulin; Blue: DAPI. (C) A549 and H460 cells were transfected with an expression vector for Aurora-A or control (vector) and detected by western blotting (left panel). Cells were treated with indicated concentrations of DDP for 24 h and subjected to MTT assay (right panel). (D) Aurora-A was overexpressed in A549 cells through lentivirus-mediated gene transfer. Two days after transfection, cells were selected by using 2 μg/ml puromycin. Cells were harvested for western blotting analysis and subjected to colony formation assay with incubation of DDP (2, 5 μM) or vehicle (0 μM) (n = 3), **p < 0.01, two-tailed Student’s t-tests. We knocked down Aurora-A expression in A549/DDP and H460/DDP cells by siRNA (Figure 5A, left panel), and found that it resulted in a significantly enhanced sensitivity to cisplatin (Figure 5A, right panel). 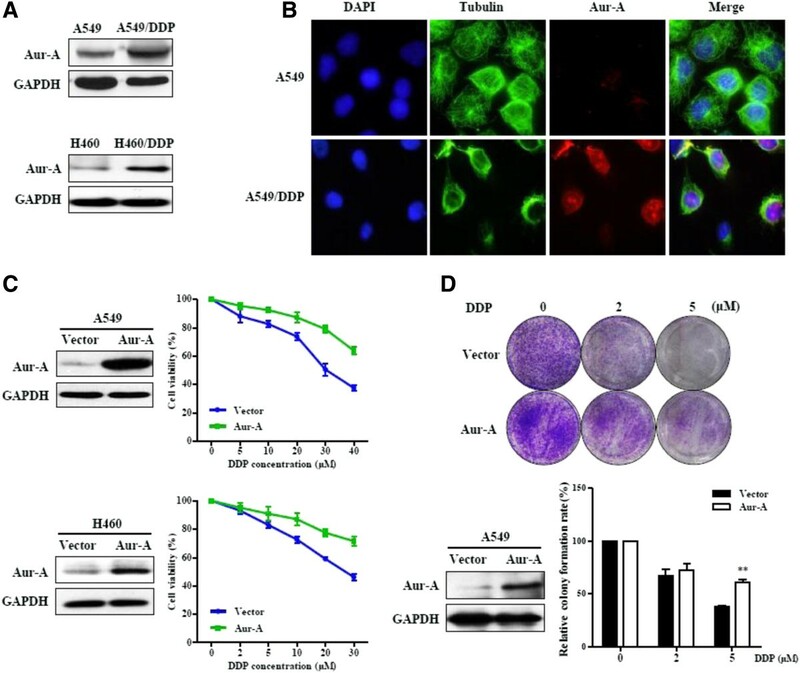 Colony formation assays showed that down-regulation of Aurora-A by Tet-inducible RNAi suppressed proliferation of A549/DDP cells severely in the presence of cisplatin (Figure 5B). We then used VX-680, a small-molecule inhibitor of the Aurora kinases, and Aurora-A kinase specific inhibitor MLN8237 to determine whether inhibition of Aurora-A activity would induce the similar effect. As expected, incubation of A549/DDP cells with increasing doses of VX-680 or MLN8237 led to decrease in Aurora-A phosphorylation at Thr288 (Figure 5C). Phosphorylation inhibition was also observed in histone H3 at Ser10 (Additional file1: Figure S4). A549/DDP and H460/DDP cells were treated with single-agent DDP, VX-680, MLN8237, or DDP in combination with VX-680 or MLN8237. The results showed that the cytotoxicity effect of DDP, VX-680 or MLN8237 was not obvious, while combination of DDP and VX-680 or combination of DDP and MLN8237 produced significant higher cytotoxicity effects (Figure 5D; Additional file1: Figure S5). We also assessed apoptotic cell death by annexin V-FITC staining. The combination treatment induced higher proportion of apoptosis, compared with single-agent treatment (Figure 5E). Inhibition of Aurora-A reduces cellular resistance to cisplatin. (A) A549/DDP and H460/DDP cells were transfected with negative control (NC) or Aurora-A siRNA for 48 h and subjected to western blotting (left panel). RNAi-treated cells were incubated with indicated concentrations of DDP for 24 h, and were harvested for MTT assays (right panel). (B) A549/DDP cells expressing Aurora-A shRNA or GFP shRNA (control) under Tet-inducible system were treated cells with doxycycline (Dox, 1 μg/ml) for 48 h and harvested for western blotting analysis. Cells were subjected to colony formation assay in the presence of Dox (1 μg/ml) and DDP (0, 2, 5 μM) (n = 3), **p < 0.01, two-tailed Student’s t-tests. (C) A549/DDP cells treated with increasing doses of VX-680, MLN8237or DMSO (control) for 24 h were lysed and subjected to western blotting. 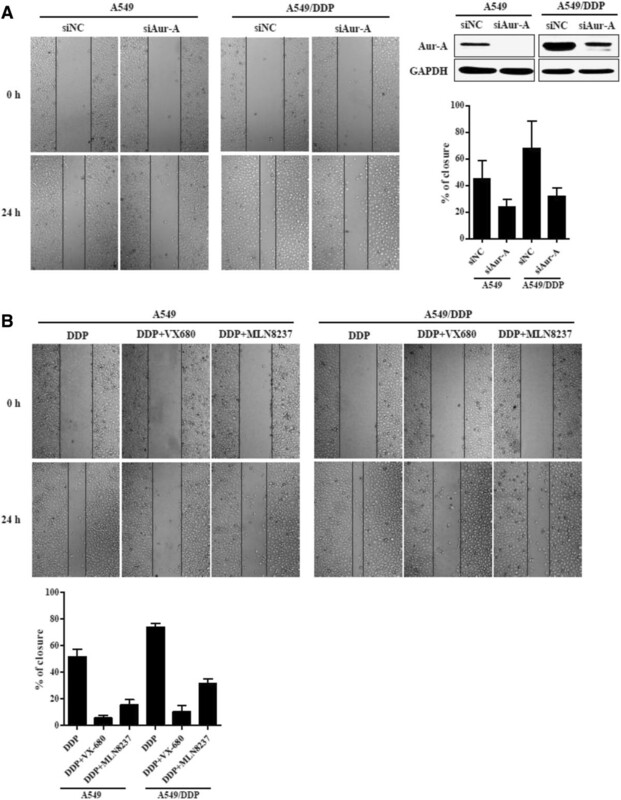 (D) A549/DDP cells were treated with DDP or VX-680, or DDP in combination with VX-680 at the indicated concentrations for 24 h, and cellular viability was assessed by MTT assay (upper panel). A549/DDP cells were treated with DDP or MLN8237, or DDP in combination with MLN8237 for 24 h, and then incubated in fresh medium for another 24 h and subjected to MTT assay (lower panel). (E) A549/DDP cells with indicated treatment for 24 h were subjected to annexin V-FITC and PI staining. Data were mean ± SD (n = 3). Given the association between Aurora-A expression levels and metastasis in NSCLC patients, we sought to identify whether inhibition of Aurora-A could reverse migration ability of cisplatin-resistant cells. We employed wound-healing assay to evaluate the effect of repression of Aurora-A on cell migration. As shown in Figure 6A, with DDP treatment, the migration ability of A549/DDP cells was obviously higher than A549 cells, and which was effectively inhibited by lack of Aurora-A expression. Similar results were observed by using Aurora kinase inhibitor VX-680 or MLN8237 (Figure 6B). Inhibition of Aurora-A reverses migration ability of cisplatin-resistant cells. (A) A549 and A549/DDP cells were transfected with negative control (NC) or Aurora-A siRNA for 48 h and subjected to western blotting. Cells transfected with siRNA were treated with or without DDP (10 μM), and the cell migration ability was examined by wound healing assay. Images were captured at the time points as indicated. (B) A549 and A549/DDP cells were treated with DDP at 0 (control) and 10 μM, in combination with or without VX-680 (5 nM) or MLN8237 (0.2 μM). Then the cells were subjected to wound healing assay and relative wound closure quantified. Platinum-based chemotherapy is commonly employed for the treatment of NSCLC. Cisplatin exerts its anticancer effect via the induction of mitochondrial apoptosis as a result of lethal DNA damage. Despite a consistent rate of initial responses, cisplatin treatment often results in the development of chemoresistance and numerous mechanisms contribute to cisplatin resistance. In this study, our data indicated that Aurora-A overexpression was associated with poor survival in NSCLC patients treated with cisplatin-based chemotherapy. Aurora-A overexpression decreased the sensitivity of lung cancer cells to cisplatin in vitro, and Aurora-A inhibition enhanced cisplatin-induced apoptosis. Additionally, Aurora-A promotes the migration in cisplatin-resistanct NSCLC cells, as well as the metastasis in NSCLC patients. Aurora-A amplification and overexpression have been reported to be significantly associated with aneuploidy, high tumor grade, increased invasiveness and poor prognosis[13, 29, 30]. Due to dysregulation of the spindle checkpoint, Aurora-A has been implicated in conferring resistance to chemotherapy in cancer cells. As the underlying mechanism of Aurora-A involving in chemoresistance, it remains complicated and varies in various types of human cancers. Elevated Aurora-A expression confers resistance to apoptosis induced by chemotherapeutic agents[16, 31, 32]. 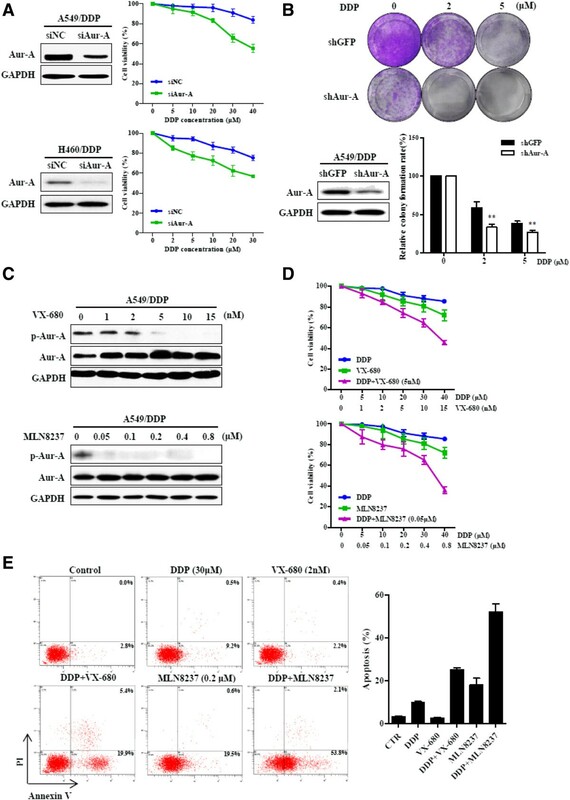 Inhibition of Aurora-A in cells expressing mutant JAK2 abolishes the resistance to cisplatin, and enhances cisplatin-induced cell death in esophageal carcinoma cells[34, 35]. It has been reported that Aurora-A induces cisplatin chemoresistance by inhibition of p53, leading to down-regulation of PTEN and activation of Akt in human ovarian cancer cells. Some studies show that Aurora-A promotes chemotherapeutic drugs resistance via a NF-κB signaling pathway in p53 knockdown lung cancer cells. Chemoresistance has been reported to correlate closely with metastasis in human cancer patients. Metastatic tumors are invariably more resistant to the chemotherapy compared to primary tumors as evidenced by the marked decrease of chemotherapy response rate in metastatic settings[38, 39]. Moreover, recent studies have shown a link between chemotherapy resistance and the EMT phenotype[40–42]. For example, resistance to cisplatin was observed in cell lines undergoing EMT[43, 44]. EMT is a process by which epithelial cells undergo transition to a mesenchymal phenotype, with increasing motility and invasive capacity. EMT increased malignant potential and reduced sensitivity to cisplatin and paclitaxel in NSCLC cells. Therapeutic combinations using EMT-signaling inhibitors may be needed to circumvent the resistance of some types of cancer to chemotherapy[45, 46]. Previously, we found that Aurora-A promoted EMT and invasion in nasopharyngeal carcinoma mediated by mitogen-activated protein kinase (MAPK) phosphorylation, and increased laryngeal squamous cell carcinoma (LSCC) cell growth and migration mediated by activation of Akt1. More recently, we further demonstrated that Aurora-A overexpression enhanced breast cancer cell migration by activating the cofilin-F-actin pathway and predicted an inferior prognosis of triple negative breast cancer (TNBC). Combined with our previous results, the presents study further support that contribution of Aurora-A overexpression to the cisplatin resistance and the poor prognosis pattern in NSCLC patients treated with cisplatin-based therapy may be ascribed to the high proliferation- and metastasis-promoting function of Aurora-A. Aurora-A may also increase the risk of metastatic recurrence against chemotherapy, although this was not proven directly in our current study due to difficulty in segregating the two functions (chemoresistance and migration). The mechanism of regulation of downstream factors by Aurora-A to clarify this link and interaction will be important matters to be addressed by future studies. In summary, our data suggest that increased expression of Aurora-A is related to cisplatin resistance and lymphatic metastasis in NSCLC and contributes to a poor prognostic phenotype. Aurora-A could be a potential cisplatin-resistance target in NSCLC, and inhibition of Aurora-A kinase is a promising regimen to overcome cisplatin resistance in NSCLC patients. Jie Xu, Cai-feng Yue, Wei-hua Zhou contributed equally to this work. This work was supported by the National Basic Research Program of China (973 Program; No. 2012CB967000 to Q. Liu), National Natural Science Foundation of China (No. 81130040 to Q. Liu), Innovative Research Team in University of Ministry of Education of China (No. IRT13049) and Pandeng Scholar of Liaoning. The funders had no role in study design, data collection and analysis, decision to publish, or preparation of the manuscript. QL and AWL carried out and coordinated the study. JX, CFY and WHZ performed the experiments and analyzed the data. CFY and WHZ wrote the paper. YMQ, YZ and SWW participated in manuscript revising and editing. All authors read and approved the final manuscript.